The matrix is controlling this machine, neo is trying to escape from it and take back the control on it , your goal is to help neo to gain access as a “root” to this machine , through this machine you will need to perform a hard enumration on the target and understand what is the main idea of it , and exploit every possible “weakness” that you can found , also you will be facing some upnormal behaviours during exploiting this machine. This machine was made for Jordan’s Top hacker 2018 CTF , we tried to make it simulate a real world attacks “as much as possible” in order to improve your penetration testing skills , also we but a little tricky techniques on it so you can learn more about some unique skills. Below is a full hacking walkthrough video on how to solve and exploit W34kn3ss: 1 machine. Write-up on how the machine was compromised and exploited can also be read below. W34kn3ss Level 1 was found by conducting a live host identification on the target network using netdiscover, a simple ARP reconnaissance tool to find live hosts in a network. Doing an nmap scan on W34kn3ss Level 1 machine’s IP address found different ports available, namely: port 22 for SSH, port 80 for HTTP and port 443 for SSL/HTTPs. Browsing first to http://172.20.86.130 showed an Apache2 Ubuntu Default page – which is pretty much the same webpage when browsed using its HTTPs version. 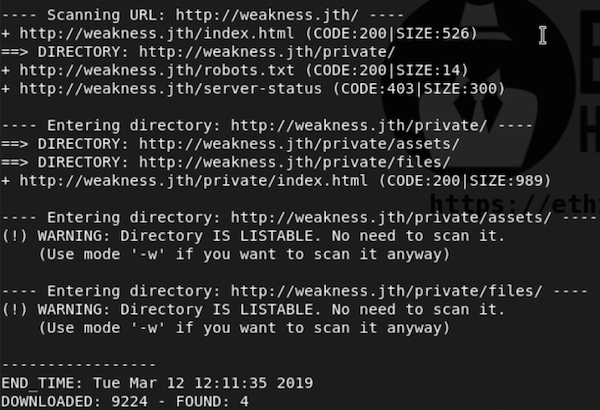 Examining the nmap scan revealed that the machine is using weakness.jth for its common name; and this information leads to adding weakness.jth to the host file pointing to the machine’s IP address. Edit /etc/host file and add weakness.jth and the machine's IP address. Browsing now to http://weakness.jth, a different landing page can be seen – wherein a “keep following the white rabbit 😀” message was shown as well as an ascii art rabbit. The message was shown that is was written by n30. dirb, a web content scanner was then used to brute force for any available files and directory on the website. This resulted on finding the available URLs below that existed on the weakness.jth website. Browsing to http://weakness.jth/robots.txt seems to be just a rabbit hole as it just showed a “Forget it ! !” message. However, browsing to http://weakness.jth/private leads to finding a “Cute File Browser with jQuery, AJAX and PHP” webpage that shows available notes.txt and mykey.pub files on it. The mykey.pub file shows a public SSH rsa key. While the notes.txt showed information that the key was generated using “openssl 0.9.8c-1“. A research on “openssl 0.9.8c-1” was conducted wherein it leads to finding out that it is connected to Debian OpenSSL Predictable PRNG vulnerability (CVE-2008-0166). OpenSSL 0.9.8c-1 up to versions before 0.9.8g-9 on Debian-based operating systems uses a random number generator that generates predictable numbers, which makes it easier for remote attackers to conduct brute force guessing attacks against cryptographic keys. g0tmi1k has an interesting Github page on it made a couple years ago which is available at https://github.com/g0tmi1k/debian-ssh. From the Github page there is available common keys, and since the public key uses RSA 2048 then the corresponding file (debian SSH RSA-2048) was downloaded which filename is debian_ssh_rsa_2048_x86.tar.bz2 (at https://github.com/g0tmi1k/debian-ssh/blob/master/common_keys/debian_ssh_rsa_2048_x86.tar.bz2). The downloaded file was then extracted. The contents of the mypub.key was then searched from the extracted files. This resulted on finding that the 4161de56829de2fe64b9055711f531c1-2537.pub is the same with the mypub.key. With this information, SSH login using 4161de56829de2fe64b9055711f531c1-2537 RSA private key was used to try to login on the W34kn3ss Level 1 machine. n30 was used as the user, as it is the only possible username found (check the information above on the “keep following the white rabbit :D” webpage to see that message was made by n30). This resulted on being able to login on the machine as the user n30. Through the user access, and checking the files in the directory of n30 user, a user.txt file can be seen which contains the first flag for the W34kn3ss Level 1 machine. Additionally, a .sudo_as_admin_successful file can also be seen from the directory of n30 user which means that the user can sudo with root permissions, though unfortunately at this point the password of the user is not yet known. The is also a suspicious executable file with filename of code, and from examining it, it is a python 2.7 byte-compiled file. The code file was then downloaded on the attacking machine and examined. Running the code file shows that it generates a unique hash for a hardcoded login info on the program. 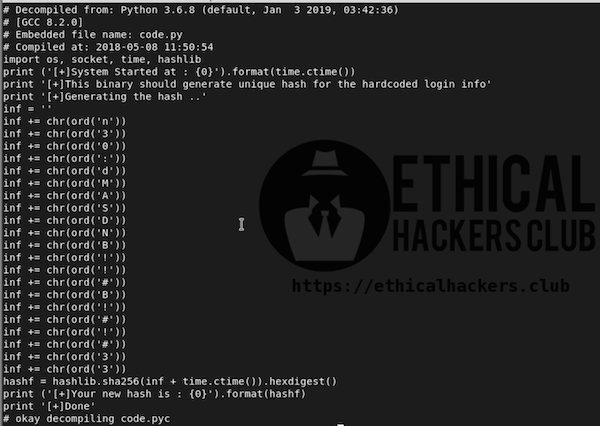 Since the file is a python byte-compiled file, we can reverse engineer it and translate it back to its python source code so it can be examined further. For this, uncompyle6, a native Python cross-version decompiler and fragment decompiler was used. uncompyle6 can be used to translate Python bytecode back into equivalent Python source code. It accepts Python bytecodes from Python version 1.3 to version 3.7, spanning over 22 years of Python releases. Using uncompyle6 resulted on acquiring the equivalent Python source code of the file. Examining the source code of the file, it can be verified that a hardcoded login info which is a character by character sequence of string does exist. While we can manually acquire the whole string, we can also just edit the python source code to display it for us. This resulted on getting the login info: n30:dMASDNB!!#B!#!#33. Going back to the SSH session on user n30, we can use sudo su command to escalate n30 user to root using the password: dMASDNB!!#B!#!#33. This resulted on getting root access on the W34kn3ss Level 1 machine! Finally, we are able to read the flag on the root directory. W34kn3ss Level 1 machine has successfully been exploited.